Image courtesy B. Mayer’s Flickr Photostream, licensed under Creative Commons. Taken during “Teardrop” during Massive Attack’s Melbourne, Australia show. It looked pretty much the same in Toronto. You know, I’d never seen the same band in quick succession during a single tour before this weekend. The list of bands I’d even consider going to two shows in, say, the same weekend is pretty short. But Massive Attack is at the top of that list, so after attending Friday’s Massive Attack show at Sound Academy with a select few members of the Panic Manual family, I ventured to Sound Academy again on Sunday, alone, to see my favourite band of the past 12 years or so for the second time in three days as a kind of pre-30th birthday present to myself. - Everything Ricky says about how bad Sound Academy is is true. I’d actually never been to this venue before, and it’s everything Ricky’s frequent bitching about it says it is. The sound system is good, and at least on Sunday the fire alarm didn’t go off repeatedly like it did Friday. But it’s an awful venue. - I personally think Ricky’s 4-rating of Friday’s show was generous. I felt for whatever reason the band didn’t really hit their stride until “Angel,” which was only two songs from the encore break. Considering my sky-high expectations going in I probably would’ve given it a 3. - That said, Sunday’s show seemed a lot tighter for two reasons: Martina Topley-Bird was better, and Robert Del Naja (aka 3D) was more engaged early on. Even during tunes he wasn’t singing, 3D was dancing, moving around the stage like the de facto frontman/conductor that he is, and was generally a lot more lively than on Friday. I still found there was a lull in the middle of the set before the band exploded into “Angel,” but it didn’t encompass the whole first half of the show like it did on Friday night. - I fully believe that Massive Attack playing “Angel” is perhaps the greatest concert experience I have had and will ever have. Horace Andy just kills this song live. The way this dark, brooding tune builds and how loud the guitar riff comes in and hits you full force…it’s magic, it really is. They could play this song at the beginning, middle and end of their set and I would love it every time. 1. It’s in the middle of nowhere. Unless you have a car, this place is pretty much a cab it there and cab it back place, adding to the overall cost of the show. It’s practically impossible to get a cab after the show too. Shows at the Sound Academy are never cheap either, so this just makes it an expensive night in general. Well I’m cheap so I guess to me it’s an expensive night. 2. It’s narrow. The Sound Academy basically is a long narrow rectangle, with the stage at the end of a the end of the long part of the rectangle. It becomes super congested at a sold out show, because there is little ways to move left and right, and everyone is always pushing forward. While this long and narrow formation may have worked for Napoleon in war, it’s awful to be anywhere but near the front at Sound Academy. 3. The stage is low. Problem #2 would be less of a problem if the stage was about 5 feet higher, the sight lines are awful since the stage is raised only a few feet above the ground. These two brown girls behind me had to keep on tippy toeing to see the band. Totally felt sorry for them, but I wasn’t gonna offer up my spot..haha. 4. The fire alarm doesn’t know the different between smoke machine and fire. The fire alarm went off at least 3 times during the show, distracting for sure. Having said all that, the Sound Academy does have a fantastic sound system, so I guess that’s why a band as meticulous as Massive Attack would want to play there. Originally, I had practically written an essay about the show, but my computer decided to freeze before I could save it and my heart is a bit broken at this point so I’ll just do a capsule of what I wrote. The light show was fantastic. It was usually synced up to the song and the bars of light dominating the stage gave the band a great visual aspect to the show that only enhanced each song played. 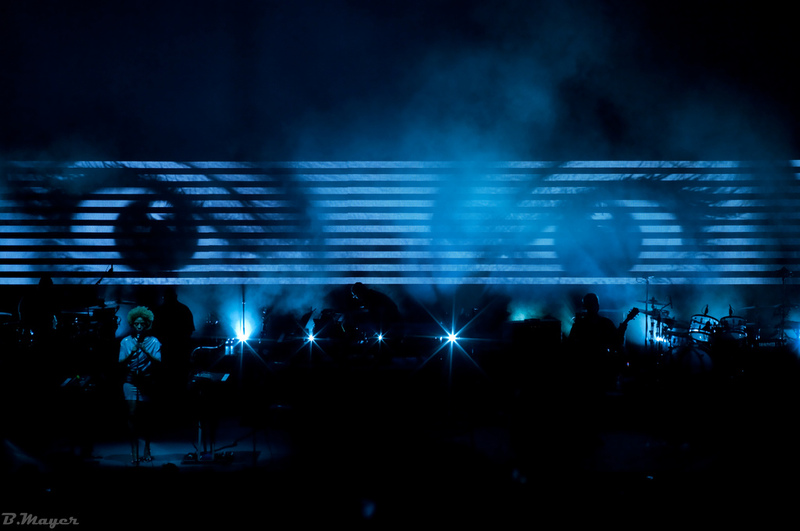 Some people might complain that the amount of political text, quotes, anti war/us sentiments and other words showed on the screen during the song might be a distraction, but if you know Massive Attack, you know they aren’t ones to just idly play a show without pushing forward some of their own ideologies. I think most of the crowd was super high anyways, so it was just a collage of colors. Angel and Safe from Harm were amazing. Angel is one of the best songs you can see live – it’s got an extremely slow , tense buildup. I think it’s one of those songs that best exemplifies dread. As Horace Andy sings the song and it builds to its eventual payoff, the lights grow dimmer and dimmer and then BAM. A blast of light and the wailing guitars. Definitely one of the songs live that you get the chills from. With Shara Nelson long gone, Deborah Miller has definitely made Safe from Harm hers. Her strong pipes lifted this song to epic proportions with an extended outro that featured bass lines so dirty you felt like you should take a shower afterwards. One of the things I loved about Massive Attack concerts are the extended intros and outros to each song. Most people might write off Massive Attack as trip hoppy chill music, but in a live element, there is nothing chilled about it, it’s an electro-rock spectacle. The new material sounded decent live, but clearly they were still fleshing it out as a live band and while there were good responses to Splitting the Atom and Atlas Air, Pysche, featuring Martina Topley Bird, got less of a positive response. Overall, the show was good considering it was at the Sound Academy. 3D, Daddy G and Horace Andy have insane stage presence and Daddy G and Horace Andy definitely come off as two of the coolest cats in the land. It goes without saying that Massive Attack is a must see live.